Air entrainer for mortar. 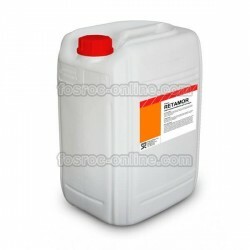 Use with set-delayers Retamor 21 or Retamor 25.For mortars with sands containing high fine particle content. Dosage: 0.3-0.7% over cement weight. Air entrainer for mortar. Use with set-delayer Retamor 26. For single-grain sand mortars or mortars with significant differences in the distribution of grain sizes. Air entrainer for mortar. Use with set-delayers Retamor 23, 24, 25 or 26. For mortars with different types of sand. Set-delayer for mortar. Use with air entrainer Retamor 11. Workability retention: 24-48 hours. Dosage: 0.3-1.6% over cement weight. Set-delayer for mortar. Use with air entrainer Retamor 14. Workability retention: 24-48 hours. Set-delayer for mortar. Use with air entrainers Retamor 11 or 14. Workability retention: 48-72 hours. Set-delayer for mortar. Use with air entrainers Retamor 13 or 14. Workability retention: 48-72 hours.